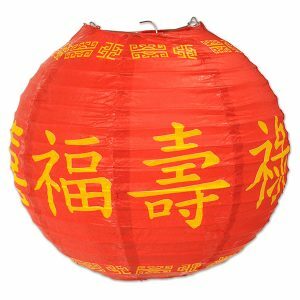 This pack of 3 Asian Paper Lanterns, measure 24cm. 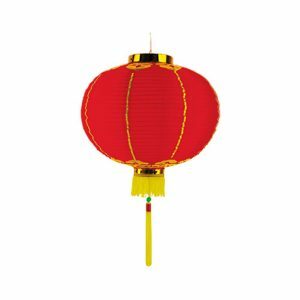 The lanterns are red with a yellow oriental design and make a great decoration for Chinese Themed Events. 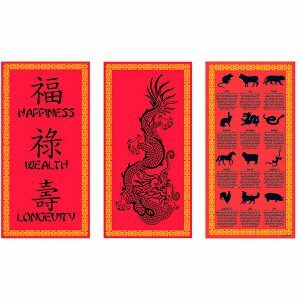 Pack of 3 red posters featuring a Chinese dragon, Chinese New Year animals & horoscopes descriptions plus Happiness, Health & Longevity. 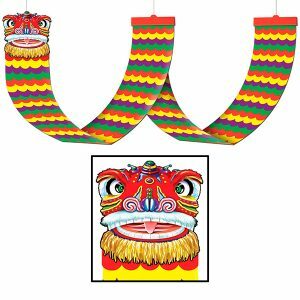 Double sided card, measures 51cm x 25.5cm, perfect decoration for hanging at Chinese Themed events. 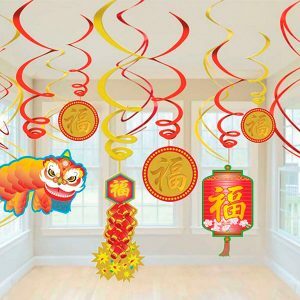 Hang this dragon decoration from your ceiling to brighten up your Chinese New Year celebrations. The elaborate face is printed onto sturdy card, and the stripy plastic body drapes in 2 loops, creating a great party centrepiece. These foil swirls are a great way to decorate your home or venue for Chinese New Year celebrations. The pack of 12 includes 6 plain swirls and 6 with cardboard cut-outs in the shape of coins, Chinese dragons and more. 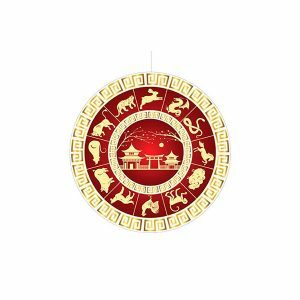 This Chinese Zodiac Hanging Cut Out measures 28cm and is decorated with the signs of the zodiac. Makes a great decoration for your Chinese Themed Event. 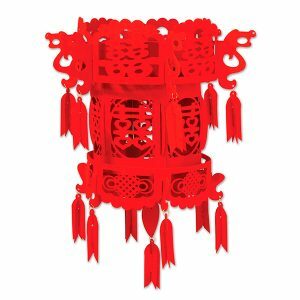 This red Felt Chinese Palace Lantern is 46cm in height and makes a great hanging decoration for Chinese Themed Event. Our Oriental Lantern with Decorative Tassel makes a great decoration for Chinese themed events. The lantern has a convenient hanging handle and is ideal for indoor or outdoor use. Size: 8 Inch(20cms). 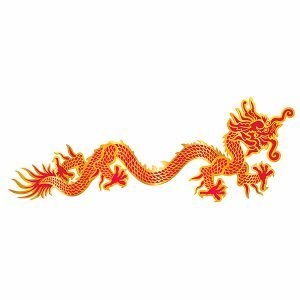 A Jointed Dragon is the perfect wall decoration for your Chinese New Year celebration or Asian themed festival. Hang it across a 6 foot section and pose however you like. The limbs and body can all be moved to suit your style. Hang this Asian Tissue Dragon up to make a huge impression on your party guests. 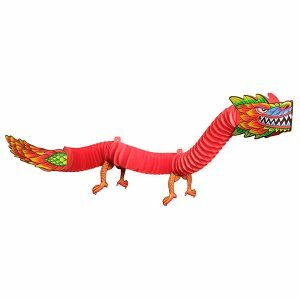 This inexpensive party decoration measures 1.8m long when fully extended. You can hang the Asian Tissue Dragon over a doorway or just have him dangling from the ceiling. This decoration is full of bright colors, reds, greens, blues and is the perfect decoration for your Chinese themed parties! 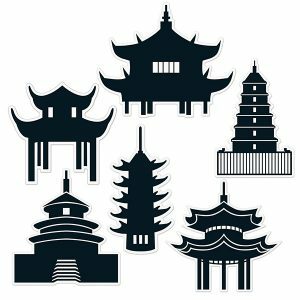 These Pagoda Silhouettes are the perfect decoration to add to your Chinese themed party! They are made of cardstock and sizes range in measurement from 11 inches to 14.5 inches. Contains six (6) pieces per package. 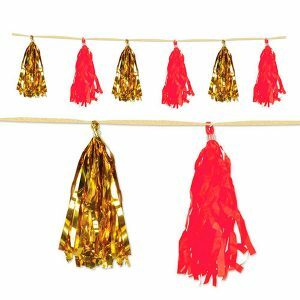 This Red & Gold Metallic & Tissue Tassel Garland measures 2.4m x 25cm and makes a great decoration for Chinese Themed Events. 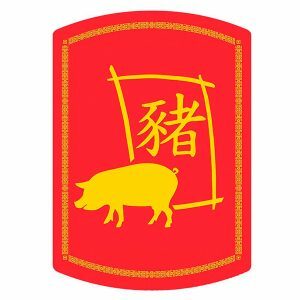 Celebrate the Chinese New Year with the 2019 Year of the Pig Cutout. Embellish your wall, door, or table with this colorful sign to add an eye catching decoration to your party.